One of an occasional series of posts about books dealing with dystopias and apocalyptic futures. I have SOOOO many mixed feelings on this book, I'm really hoping others have read it and will be interested to discuss. 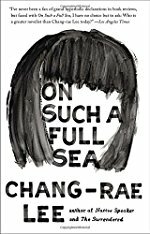 Chang-Rae Lee is such a skilled writer, I'm very curious to read his less speculative fiction. Ultimately, I found the ideology of this book too troubling and problematic. But there were aspects of it that were so compelling, namely the hero, Fan, who is such a quiet and private protagonist, very unlike other heroes I think. It was the descriptions of the Countries People I found most troubling: like these sections were clearly written by someone who has never been poor and probably has spent little time with poor people, as every interaction in the Countries ends in extreme and gratuitous violence. This seems grounded in a rich suburban person's fears about how poor people behave. And the book seems most comfortable in it's descriptions of the rich. But it's the laborer class in B-Mor that is the most interesting part of the book conceptually, and I can see how this idea grew out of the author's previous concept of doing a book set it Shenzhen. Anyhow, I'm so curious how others felt about this book. It’s been a while since I read this, but I am so excited to see there’s a Fanfare post because I remember, after finishing it, wanting to talk about it to anyone who would listen. I couldn’t put it down. The other two most realistic details I recall are the infrastructure breakdown—how bad the roads are—and that everyone has cancer, like as a matter of fact. *now, almost a year deep in the Trump era, it does seem weird that the urban areas would be favored and regulated, while rural areas are left to rot.